U.S. CVN 78 Aircraft Carrier - USS Gerald R. Ford - First new class of nuclear-powered carriers. The Ship is designed to carry drones and launched figter planes more quickly. Nevertheless, U.S. military officials often talk about preparing for a conflict in the Pacific—without mentioning who they might be fighting. The situation resembles a Harry Potter novel in which the characters refuse to utter the name of their adversary, says Andrew Krepinevich, president of the Center for Strategic and Budgetary Assessments, a think tank with close ties to the Pentagon. "You can't say China's a threat," he says. "You can't say China's a competitor." China's state media has said its new missile, called the DF-21D, was built to strike a moving ship up to about 1,700 miles away. U.S. defense analysts say the missile is designed to come in at an angle too high for U.S. defenses against sea-skimming cruise missiles and too low for defenses against other ballistic missiles. In response, the Navy is developing pilotless, long-range drone aircraft that could take off from aircraft carriers far out at sea and remain aloft longer than a human pilot could do safely. In addition, the Air Force wants a fleet of pilotless bombers capable of cruising over vast stretches of the Pacific. Throughout history, control of the seas has been a prerequisite for any country that wants to be considered a world power. 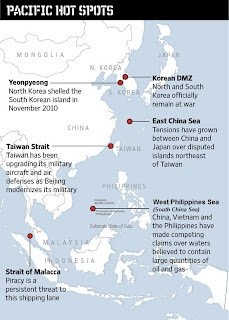 China's military buildup has included a significant naval expansion. China now has 29 submarines armed with antiship cruise missiles, compared with just eight in 2002, according to Rand Corp., another think tank with ties to the military. In August, China conducted a sea trial of its first aircraft carrier—a vessel that isn't yet fully operational. 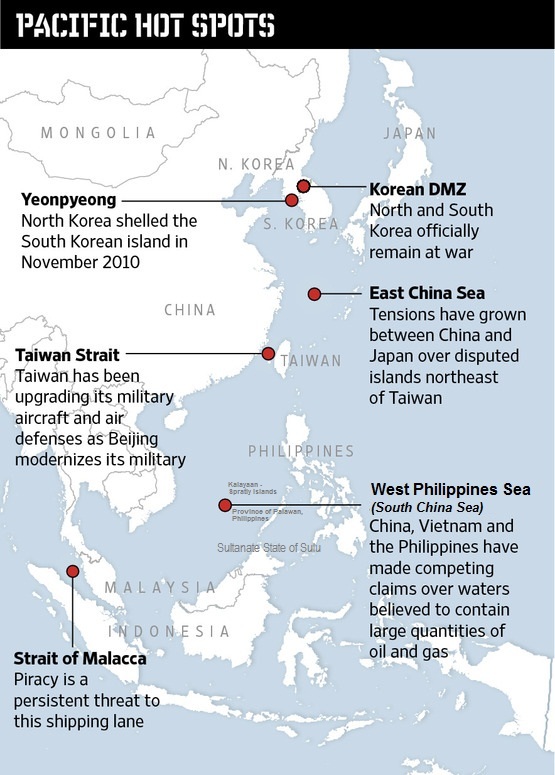 At one time, military planners saw Taiwan as the main point of potential friction between China and the U.S. Today, there are more possible flash points. Tensions have grown between Japan and China over islands each nation claims in the East China Sea. Large quantities of oil and gas are believed to lie under the West Philippines Sea (South China Sea), and China, Vietnam, the Philippines and other nations have been asserting conflicting territorial claims on it. Last year, Vietnam claimed China had harassed one of its research vessels, and China demanded that Vietnam halt oil-exploration activities in disputed waters. The Philippines protested also against china for firing the Filipino fishermen in the waters under the Philippines Territory, China also harassed the PNOC – Philippines State Owned Exploration vessel conducting Survey in the Philippines Economic Zone and inside Philippines territory but china dismissed the protest of the Philippines and replied "We owned everything". A few years ago, the U.S. military might have responded to any flare-up by sending one or more of its 11 aircraft carriers to calm allies and deter Beijing. Now, the People's Liberation Army, in additional to the missiles it has under development, has submarines capable of attacking the most visible instrument of U.S. military power. "This is a rapidly emerging development," says Eric Heginbotham, who specializes in East Asian security at Rand. "As late as 1995 or 2000, the threat to carriers was really minimal. Now, it is fairly significant. There is a whole complex of new threats emerging." "Warfare is about anti-access," said Adm. Gary Roughead, the recently retired U.S. chief of naval operations, last year. "You could go back and look at the Pacific campaigns in World War II, [when] the Japanese were trying to deny us access into the western Pacific." Last year, the arms race accelerated. In January, just hours before then U.S. Defense Secretary Robert Gates sat down with Chinese President Hu to mend frayed relations; China conducted the first test flight of a new, radar-evading fighter jet. The plane, called the J-20, might allow China to launch air attacks much farther afield—possibly as far as U.S. military bases in Japan and Guam. American military planners are even more worried about the modernization of China's submarine fleet. The newer vessels can stay submerged longer and operate more quietly than China's earlier versions. In 2006, a Chinese sub appeared in the midst of a group of American ships, undetected until it rose to the surface. "The U.S. has four major allies within the first island chain, and is trying to starve the Chinese dragon into a Chinese worm," Maj. Gen. Luo Yuan, one of China's most outspoken military commentators, told a conference in September. "My whole impetus was to look at the whole western Pacific," says retired Air Force Gen. Carrol "Howie" Chandler, who helped conduct the war games. "And it was no secret that the Chinese were making investments to overcome our advantages in the Pacific." "The ability to operate from long distances will be fundamental to our future strategy in the Pacific," says Andrew Hoehn, a vice president at Rand. "You have to have a long-range bomber. In terms of Air Force priorities, I cannot think of a larger one." "The Gerald R. Ford is just the first of her class," wrote Navy Captain Henry Hendrix and retired Marine Corps Lt. Col. Noel Williams in an article in the naval journal Proceedings last year. "She should also be the last."